When you whiten your teeth, you will see a brighter, more pleasing shade when you smile and show off your pearly whites. However, just because your teeth are whiter, it does not mean that you can slack off on your oral hygiene routine at home. As this video from the American Dental Association explains, tooth whitening only removes stains from teeth; it does not clean off harmful bacteria and plaque that may lead to decay. Therefore, any whitening treatment should be accompanied by regular brushing and flossing with whitening toothpaste that will help to maintain the results. For a look at whitening treatment options or an overview of proper oral care at home, schedule your next dental checkup with Dr. John Carson, DDS in Tucson. For a look at our complete line of advanced dental services, visit our website. To make an appointment, call us at (520) 514-7203. Modern dental restorations are designed to function like the natural teeth do, and no other treatment has had as much success in this challenge as dental implants. If you are considering dental implants to replace missing or extracted teeth in your smile, review these FAQs to start learning about the details of treatment. Dentures replace teeth on the superficial level, but they do not provide any structure under the gum line. They are not permanent and need to be removed for cleaning. Dental implants look and act like your natural teeth right down to the jaw line. Implants are affixed to the jaw, which prevents bone loss and ensures a secure fit for the new tooth to allow optimal freedom in eating, speaking, and oral hygiene. What steps are involved in treatment? The process of treatment with dental implants is rather extensive and takes place over a series of visits to the dentist’s office. Because of the significant long-term benefits of dental implants, many patients find the initial investment in treatment worth the time when they see and feel the final results. Individual treatment timelines can vary depending on the need for bone restructuring before the placement of the implant. Dental implants are a treatment for tooth loss, and ideally patients will seek treatment just after the tooth is extracted so that optimal bone tissue is still in place in the jaw. Treatment can take place down the road as well, but the process will be more complex because bone grafting will likely be needed before implants are put in. Only your dentist will be able to determine your candidacy for dental implants, though, so you should schedule a consultation to explore all of your treatment options. Under the care of John Carson, DDS, you can make informed decisions about your smile and restorative therapies that will give you healthier teeth worth showing off. To schedule an appointment at Dr. Carson’s Tucson dental practice, call (520) 514-7203 today. Congrats to Dr. Carson on his latest award! 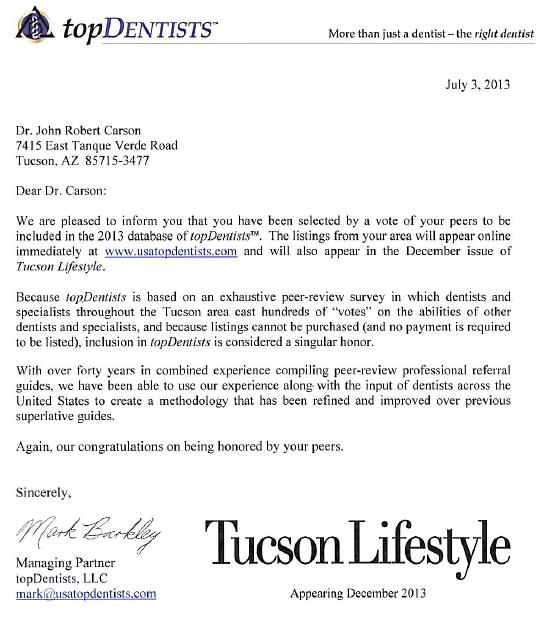 We are very excited about this recent award from topDentists. Congrats Dr. Carson!!! Following a good oral care routine at home and seeing a dentist for regularly scheduled check-ups and cleanings is a great way to ensure healthy teeth and gums for a lifetime. Dr. John Carson, DDS, is happy to help patients improve their oral health by personalizing treatment plans and offering comprehensive patient education. Please call our Tucson dentistry office at (520) 514-7203 to schedule an appointment or ask any questions you may have. In the meantime, follow the links below for more information on caring for your smile. The American Dental Association discusses the importance of good oral hygiene during pregnancy and offers some advice for expectant mothers. View this slideshow by The Huffington Post to read about some of the worst foods for your oral health. The Centers for Disease Control and Prevention (CDC) discusses the basics of community water fluoridation and explains the benefits of fluoride for your teeth. Learn the proper techniques for brushing your teeth with this article by Colgate. Did you know that the Centers for Disease Control and Prevention (CDC) praised community water fluoridation programs as being one of the most remarkable health achievements in the modern era? Fluoride offers incredible benefits for your oral health; it remineralizes teeth to strengthen them. By reinforcing your tooth enamel, fluoride helps prevent tooth decay. Keep your smile healthy by talking to your dentist about your fluoride needs. Your dentist may recommend using fluoridated toothpaste or undergoing professional topical treatments. At the Tucson office of Dr. John Carson, DDS, we’ll customize a treatment plan that’s right for your unique oral care needs. Please call (520) 514-7203 to schedule a dentist visit or click through to our website to learn more about our services.